Kalvin Phillips Leeds United in front at Norwich. Picture Tony Johnson. Head coach Paul Heckingbottom was left frustrated by Leeds United’s latest defeat as they went down tamely at Norwich. The Whites looked on course for Heckingbottom’s first away win at the club when a fine strike by Kalvin Phillips put them ahead, but Wes Hoolahan’s deflected effort and a Josh Murphy goal turned the game round as Norwich won 2-1. The defeat saw Leeds drop back down to 14th in the Sky Bet Championship and they have taken just 13 points in Heckingbottom’s 15 games in charge. 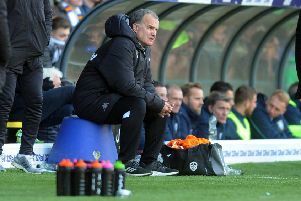 The Leeds boss felt the performance summed up what he has found at the club - that there needed to be a change in mentality. He said: “What it’s given me is how certain I am in terms of what has to happen and what needs to change. “I’ll sit down with anyone now and argue my point because I know I’m right and it’s sometimes nice to be that certain, in what you have seen and what you know and how you are going to go about it. “That’s a nice feeling to know how certain you are and the hard work starts on making it happen now. “We have to change the whole mentality of the group, definitely. On the game itself, Heckingbottom added: “It was frustrating. “We spoke about guarding against it being an end of season game and like a testimonial with the things that were going off. It felt like that. “There were lots of good of things in the first half you could point at but the game was played with few chances because it was all played in front of each other and it was like a testimonial at the end of the season. “But I felt it was there for us for the taking. We get a lead and with better game management in the final two minutes of the first half, deal with things better and take our chances, there’s no danger. United’s penultimate match of the season rarely sparked into life before Phillips broke the deadlock with a well struck half-volley from outside the box. Kemar Roofe then had a decent chance to double the lead almost immediately, but was off target with his shot before Norwich equalised in fortuitous manner with Hoolahan’s strike from range looping high into the net after taking a wicked deflection off Pontus Jansson. Bailey Peacock-Farrell made a good save to deny James Morrison after the break, but could have done better with Murphy’s strike that won the game for the hosts in the 69th minute. Before that Phillips and Samuel Saiz saw efforts saved, but Leeds failed to create much after falling behind apart from a late chance when substitute Adam Forshaw’s shot was saved and Roofe sending two headers wide. Norwich: Gunn, Reed, Hanley, Klose, Lewis, Leitner, Vrancic, Maddison (Hernandez 87), Hoolahan (Trybull 85), Murphy, Oliveira (Srbeny 82). Leeds: Peacock-Farrell, Pennington, Jansson, Cooper, Pearce (Lasogga 83), Vieira (Forshaw 74), Phillips, Saiz, Hernandez, Alioski (Grot 70), Roofe.